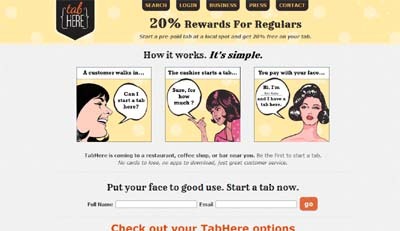 TabHere allows coffee shops and bars to offer 20% rewards to regulars who start pre-paid tabs. No phones, apps, or cards to carry, all you need is your name and a photo at the register. Imagine walking up to the counter, ordering a cup of coffee, and then saying, “Put it on my tab.” Oh and then imagine getting every fifth cup of coffee free just for being a regular patron. Thats what TabHere is, the ultimate old fashioned personal customer experience at the places where you go most often. TabHere does not require a phone, app, or physical gift card. It uses your name and a photo you upload from home to identify you at the merchants register. This approach improves user experience and opens up the market for rewards and payments. The 20% reward is a combination of “punch card” and credit card fee reduction, costing the merchant nothing. Unlike other rewards programs, TabHere can bring new customers through the door by requiring all regulars ( most loyal customers ) to gift a small part of their tabs to new customers.